Learning about story plots was a bit of a revelation for me. I know that sounds a bit silly. 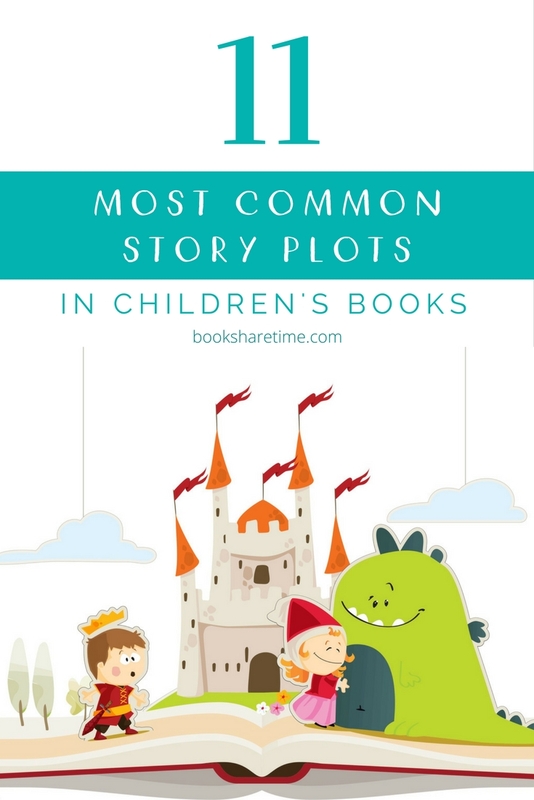 But I had never thought about the fact that there might only be a couple of basic story plots that most stories follow in some way or another; and how teaching children about these plot patterns could make storytelling easier for them. I first learned about story plots while attending professional development on Talk for Writing. This narrative writing program has taken Western Australian schools by storm in the last couple of years, and some schools have seen some amazing results. While Talk for Writing was developed to be used by teachers as part of a whole school approach, I was able to take away some key points from the Talk for Writing training which I’ve added to my narrative intervention toolkit. One of which was, you guessed it, story plots! A story plot outlines the sequence of events in a story, that is, what happened in the story and the order it happened in. Christopher Booker wrote about the seven universal story plots that underpin all stories. Pie Corbett then made this concept child-friendly in his Talk for Writing program by outlining some simple plot patterns that children are likely to come across in their encounters with books and stories. Of course, there are many other story plots as well, but these tend to be the most common ones. The main character has some sort of flaw which lands them into trouble. The story often ends with the character learning their lesson and changing their ways. Everything is well for the main character until a threat appears. The threat is difficult to defeat, but the character eventually overcomes it using their resourcefulness or a positive character trait (e.g. honesty, courage, kindness). The main character finds something valuable, interesting or important. But finding this object may lead to things going wrong. The character has to overcome the problems, sometimes by discarding the valuable item in some way. The main character goes on a quest or adventure. They usually go on this journey to complete a specific task. The character will face a series of challenges, trials or temptations which they will need to overcome to succeed and find their way back home. The story starts with the main character having a valuable item. The character loses the precious item and has to either search for it or face the consequences of losing it. The story may end with the valuable item being found again. The main character meets someone or something which leads to a dilemma. The main character might have to look after this new acquaintance or keep them a secret. Alternatively, the two characters might argue and go their separate ways. But something terrible happens to one of them. Luckily the other character helps them, and they are able to overcome their differences and be friends. The main character feels upset or mistreated because of the situation they are in at the beginning of the story. The character overcomes their difficulties and is often transformed in some way. This transformation can include either appearance, personality or opinions. The story contains a very strong repetitive pattern. This pattern is often found in popular children’s books and fairytales. The main character is afraid of something and encounters a situation in which they have to face their fear. After some difficulty, the character is eventually able to conquer their fear. The main character is warned not to do something, but they ignore the warning and do it anyway. Something goes wrong which lands the character in trouble. The character is eventually rescued and (hopefully) learns their lesson! The main character wants something badly but is prevented by some sort of barrier that needs to be overcome. Once this is overcome the character gets what they wished for, but sometimes their desire was not worth it after all! Variation of a wishing tale: the main character is granted a wish, but ends up wasting it. You can use Book Share Time’s story plot filter to find more books that fit with the above story plot patterns. Now, most stories don’t fit neatly into these story plot descriptions as they are usually a combination of lots of different plots all mixed together. But, teaching children to identify and internalise the various plot patterns in stories can help them with their story retells and narrative writing skills. How can learning about story plots support children’s storytelling skills? 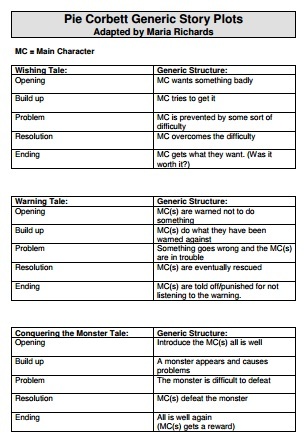 I really love how Maria Richards, a Talk for Writing consultant, has broken each of these story plots into the basic narrative structure of: opening, build up, problem, resolution, ending. See the image below for a preview. This structure forms an easy to follow blueprint from which children can expand to create their own unique stories. Of course, children don’t need to know all the story plots mentioned above off by heart, but having at least some knowledge of the plot patterns can help to improve their storytelling skills. Maria Richards states that many schools choose about six story plots and teach these every year so children have a bank of plot patterns they can draw on when creating their own stories. Being familiar with a range of basic story plots can support children in generating narratives as it may help them to focus on improving the quality of their stories, rather than having to worry so much about the content (i.e. what exactly is going to happen in the story). Teaching children about different story plots can be a great addition to the bank of evidence-based teaching strategies you should be using in your narrative sessions, including the explicit teaching of story grammar, use of graphic organisers, extensive modelling and guided practice. 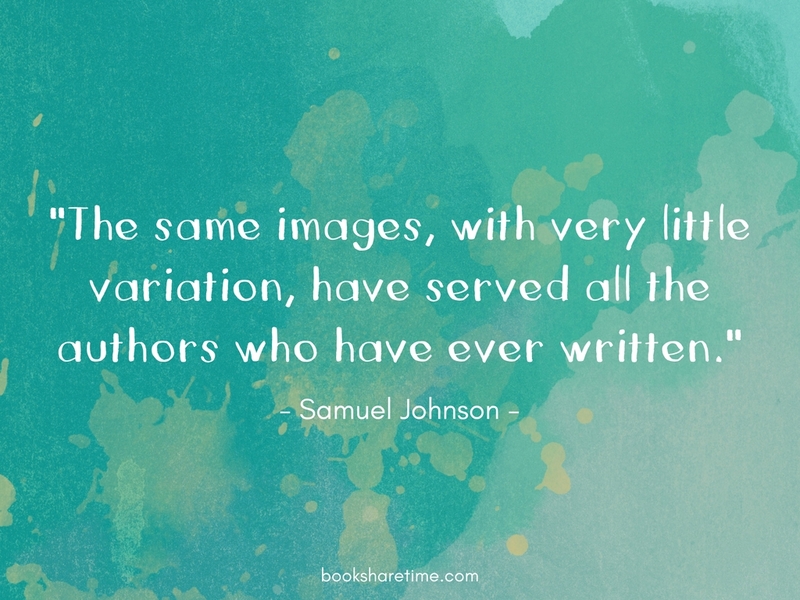 So next time when you’re choosing books for your narrative sessions, take a minute to think about what pIot patterns they follow and make sure you’ve included books with a couple of different story plots.